Welcome to a brand new linky - Love Where I Live! 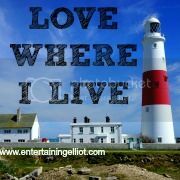 Love Where I Live is a new linky where you can shout about all the things you love locally. Maybe you have some stunning photography you want to share, or maybe you want to tell the world about a fun local attraction you recently visited. Maybe you've got a favourite cafe, or a favourite shop you want to blog about. Anything goes really, as long as it's about where you live! Feel free to tweet me @eelliotblog using the hashtag #LoveWhereILiveLinky and I will retweet your posts. I will also comment on each one. Make sure you comment on at least 2 other blogs, more if you have time! The linky will run from Thursday 12.01am until Sunday 11.59pm.